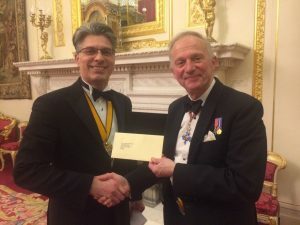 There is no idle moment for Trust Chairman, AVM Nick Kurth, who was guest of honour at a dinner held by the Tobacco Pipe Makers and Tobacco Blenders on Wednesday night at Goldsmith’s Hall in London. He spoke about the work of The Ulysses Trust and the benefits the Charity brings. Nick passed muster as he was presented with a generous donation to the Trust at the end of the evening by the Master Roger Brookes, on behalf of the Livery Company. Whilst Nick takes most things in his stride, he did have second thoughts when snuff was passed around at the conclusion of the dinner!